South Africa needs no real introduction to the travel market. The fact that the country has such a rich history and culture alone make it a prime destination to explore for both local and international travelers. At Domestic Flights-SA, we make it simple for wanderers to don their backpacks, pull out their local SA maps, book cheap tickets online and begin traveling across the country. Whether you are looking for a beach, bush or city escape, South Africa has it all and then more. From buzzing nightlife to historical buildings and museums, tranquil and serene countryside settings there’s something for everyone in South Africa. So why not book cheap plane tickets to any of the country’s top destinations now! Whether you prefer to fly directly into the Kruger National Park (which spans the eastern parts of both Limpopo and Mpumalanga) to enjoy the thrill of a game drive, or fly into Cape Town and take a leisurely drive to Hermanus where you can appreciate another aspect of nature as you do a bit of whale watching; with low-cost carriers in the country, you can do either….or both! While South Africa is undeniably a popular country to travel and explore, many visitors are pleasantly surprised to find just how affordable it is to travel to local destinations by air. With the help of Domestic Flights-SA, you can search and compare cheap flight prices across all major and low-cost airlines. Currently, there are several local airlines for you to choose from including FlySafair, Kulula, and Mango airlines. If cheap flights are a top priority for you, these airlines will be the best options for pocket-friendly local flights. Of course, you can also find great deals with SA Express, Airlink, and SAA. There’s a reason why many international travelers choose to visit South Africa when looking to experience a taste of Africa. The country offers gorgeous scenery in the form of golden savannahs, deep gorges, vast and beautiful deserts and a plethora of unique fauna and flora. Cheap airline tickets make it possible for you to explore all that the country has to offer…and trust us, you don’t want to miss out on any of it! In addition to the large national game parks including Kruger National Park and Kgalagadi Transfrontier Park in the Kalahari, South Africa also hosts some of the most luxurious game lodges and reserves in the world. The Big Five is an exciting drawcard for both local and international travelers. Have you truly ‘done’ Africa if you have never seen lion, buffalo, leopard, rhino, and elephant, and how about the little five? Be sure to ask a ranger about the buffalo weaver, the ant lion, elephant shrew, leopard tortoise and rhino beetle! Apart from Africa’s Big (and Little) Five, there are coral reefs and towering mountains to explore, exhilarating whitewater rafting adventures and ocean dives, or pure relaxation on remote sandy beaches. South Africa has the best of it all and with the opportunity to get cheap flight tickets online, you can cut back on travel costs and have more to spend at the destinations of your choice. Stop dreaming of the perfect holiday have one! Book a flight online and explore a part of the country that you’ve never been to before. Explore the city lifestyle of Cape Town, the gorgeous surf and beaches of Durban, the cultural and historical background of Johannesburg, and experience Soweto which is thriving with African culture! You can do all of this by booking cheap flights online! Cape Town International Airport: Table Mountain, Lions Head, Kirstenbosch Botanical Gardens, The Wine Route, False Bay, Cape Point, V&A Waterfront, Two Oceans Aquarium, Camps Bay and Chapmans Peak. Mpumalanga International Airport in Nelspruit: Kruger National Park, Gods Window, Mac Mac Falls, Blyde River Canyon Nature Reserve, Sudwala Caves, Berlin Falls, Long Tom Pass, Chimp Eden and Elephant Whispers Sanctuary. OR Tambo International Airport in Johannesburg: Apartheid Museum, Cradle of Humankind, Hector Pieterson Museum, Montecasino, Johannesburg Botanical Gardens, Wonderboom Nature Reserve, Gold Reef City, Soweto, Mandela House, Voortrekker Monument and Freedom Park. Kimberly Airport in Northern Cape: Kgalagadi (Kalahari) Transfrontier National Park, Big Hole, Mokala National Park, McGregor Museum, Wildebeest Kuil Rock Art Centre, Augrabies Falls National Park and Richtersveld Desert. King Shaka International Airport in Durban: Ballito, Christmas Bay, Salt Rock Beach, Margate Beach (coastal) and Royal Natal National Park, uKhahlamba-Drakensberg Park and Giant’s Castle Game Reserve (inland). To explore any, or even all of these top South African destinations, simply book your flight tickets with Domestic Flights-SA and start preparing for your trip! With our user friendly flight search feature, you can quickly and easily search and compare flights with all leading low cost and major carriers. Pay securely online too. Waste no more time! 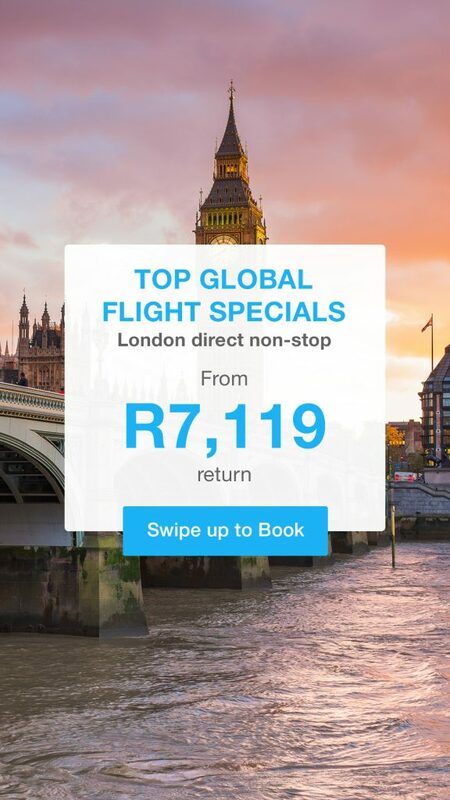 Save on cheap domestic flights and explore more of SA today!